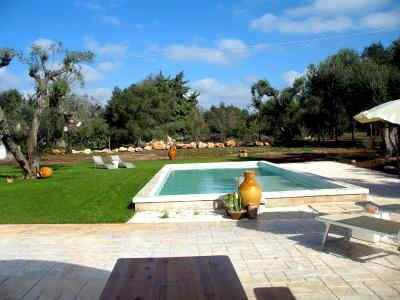 Surrounded by a large olive grove (1ha) this Puglia holiday house with pool is situated in the heart of the beautiful Itria valley close to the enchanting towns of Ostuni, Cisternino and Celgie Messapica. Lovingly restored and furnished Villa Spadalunga offers an ideal and comfortable accommodation for a relaxing holiday in the countryside. Whether on the spacious patio, under the olive tree or on the lawn behind the house – many shady and sunny places are here. And on hot summer days, the swimming pool (open from May to October), offers a refreshing bath. On the large terrace in front of the house you can enjoy outdoors at a dinner with the specialties of Puglia. Centrally located, you can do from here day trips, to Lecce, Otranto, Gallipoli. Or visit the Zoosafari of Fasano, the Caves of Castellana and the famous Trulli village Alberobello. The charming seaside with its sandy and rocky beaches are easily reached by car. Price includes water, gas for cooking, bed linen, towels, final cleaning. Payable on site: Air Conditioning / heating according to consumption, security deposit € 200,00.